We’d love your help. 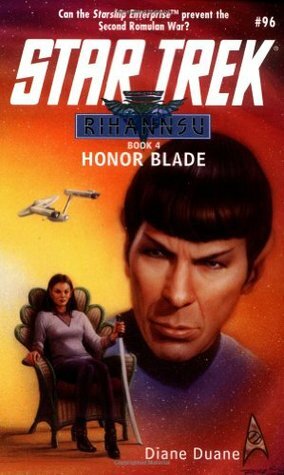 Let us know what’s wrong with this preview of Honor Blade by Diane Duane. At last, the United Federation of Planets and the Romulan Star Empire have agreed to meet on neutral ground to attempt to resolve the tangle of intrigue and conspiracy that began with the hijacking of the "U.S.S. Intrepid" many years ago -- but the meeting may be as dangerous as the war they hope to avoid. As a show of good faith, the crew of the legendary "Starship Enterp At last, the United Federation of Planets and the Romulan Star Empire have agreed to meet on neutral ground to attempt to resolve the tangle of intrigue and conspiracy that began with the hijacking of the "U.S.S. Intrepid" many years ago -- but the meeting may be as dangerous as the war they hope to avoid. As a show of good faith, the crew of the legendary "Starship Enterprise(TM) " has been ordered to attend the talks. In their informal charge is Romulan renegade Ael, the wanted fugitive who, with Kirk, served as a catalyst of the current troubles. Kirk must represent the interests of the Federation first and foremost, but the best approach to an agreement remains muddled in the ever-shifting Romulan order. And the visiting Romulan party is as fractious and divided as their troubled world. Among the Romulan nobles in attendance are the hero and popular Senator Arrhae, who secretly helped rescue Dr. Leonard McCoy from a Romulan execution, and the very men and women who put McCoy on trial for treason -- and tried to carry out the sentence. To ask other readers questions about Honor Blade, please sign up. I am strangely conflicted by this book. Firstly, my suspicions about the previous book were confirmed when this book started with 'Chapter Six'. It however, did not just jump into the action, and spent another 2 overly long chapters continuing to set the stage. After that, it was all go, but still left me feeling empty, since it's clear the author is setting up for a conclusion book. Having said all that, I could not put it down, but given my problems with it, can not give 5 stars. I'm not so sure why they split this story into two books. It was part of a series that gave a fantastic look at the history of Romulans and Vulcans. Point I disliked: after reading 1,000 plus pages of the "omnibus" version (which sometimes was a slog, despite the interesting points) it was left wide open until "The Empty Chair" resolved the whole thing. Great plot and characterizations, the Rihannsu saga has done much to hold my interest. I am a huge admirer of Diane Duane's writing talents, and look forward to reading more by her. Already in the queue to be read at some future point are her novels Doctor's Orders and The Wounded Sky. This was basically the set-up to the next book in the series. Not much happens until the last 40 pages and then ends with the infamous "to be continued." Still, it was well-written and kept my interest. For the fourth in the series it was much like the third! Continuation of the buildup to a climax that has yet to be finished. There are a few minor battles, but otherwise (as with book 3) it's an unfinished story. Definitely needed to set up The Empty Chair - the final book in the series - but of the set, my least favorite. Can't believe I fell for it again! Nothing happens, and then "to be continued..." Ugh! See review for Sword Hunt--read the combined version. It's ok. I might read more Star Trek in the future. Besides the 1980's creation of the Young Wizards fantasy series for which she's best known, the "Middle Kingdoms" epic fantasy series, and numerous stand-alone fantasy or science fiction novels, her career has included extensive work in the Star Trek TM universe, and many scripts for live-action and a Diane Duane has been a writer of science fiction, fantasy, TV and film for more than thirty years.